Taking black bear pictures can be exciting and challenging. Black bears are very photogenic animals, providing many opportunities for excellent moments to record. Being the most common bear species in North America, as well as being very charismatic and loved by many, they can make an excellent species to photograph. For wilderness skills practitioners, wildlife photography can also be an excellent opportunity to practice awareness, observation, camouflage, and stalking - often essential skills when foraging and hunting in a survival situation. Before you get started consider the following points. The first thing to consider if you choose to pursue taking black bear pictures is safety. 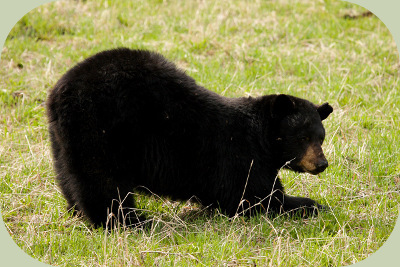 If you choose to photograph black bears in wild settings, it is important to understand some basics of bear behavior. 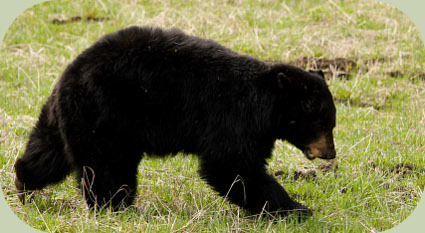 For starters, like all wildlife, black bears appreciate being treated with respect. It is vital to photograph them from at a safe distance. Bears can sometimes be approached very closely in area such as National Parks, where they are used to human presence. Even here, however, it is vital to give them considerable space and to continuously monitor their behavior. Often times, safest way to get close to wild bears is by photographing them from the window of your vehicle. 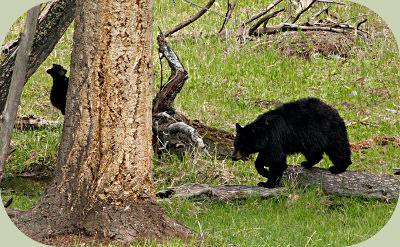 In some parks, such as in Yellowstone National Park, taking black bear pictures is very possible from your vehicle. If you get the opportunity to do so, please respect local traffic safety rules and pull safely off the road before photographing the animals. Black bears are not equally distributed across all of North America. 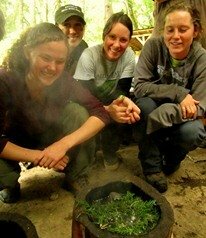 Generally, they are found in forested regions with abundant wild food and cover. 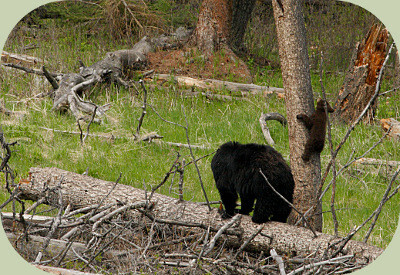 Large state parks, national parks and natural preserves are great places to look for black bears. 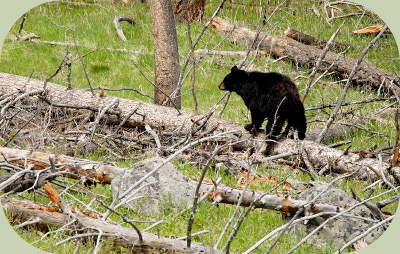 Black bears are especially common in the Rocky Mountains, Cascade Mountains and Sierra Nevada Mountains. Along the East Coast of the United States, they are also found along the Appalachian Mountains, in the Adirondacks and other large swaths of forested land. These are all excellent locations to look for black bears. 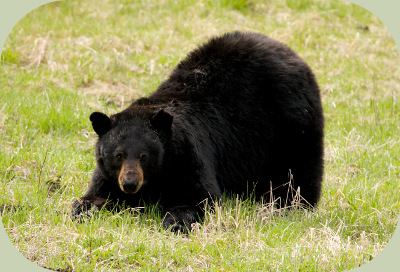 In regions with cold winters, black bears may hibernate for up to several months. 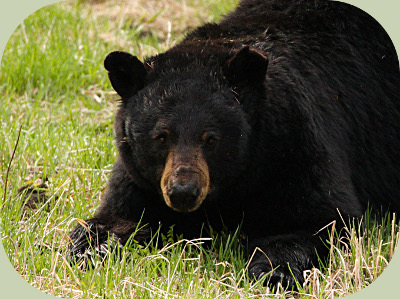 Keeping this in mind, the best time to seek to take black bear pictures is in late spring, summer or early fall. When you are approaching photographing an animal, try to imagine what you want to express about them and their way of life. This will strongly influence how you focus your energies while photographing black bears. Though, in the wild, photographing black bears can be unpredictable, it can still help to think about different ways to approach taking black bear pictures. Notice how the photo below tells a story about the animal. I placed this bear deliberately on the right side of the frame looking left. This creates a space for it to look into, and does not immediately draw your focus outside of the photo. This photo communicates several things to the viewer: this black bear lives in a forested landscape, it is balancing comfortably on a challenging surface and it is very focused on something in its environment. Photographs of wildlife in general are most interesting when they tell a story that reveals something about the animal. It is important to capture the face of an animal, as this is often the most expressive portion and we relate to it most. Portraits of bears are close up photographs that show the black bear's body filling most of the frame. In certain situations, it might be possible to also get even closer with a long lens to photograph the animals so that the face fills most of the frame. Photos with eye contact can be dramatic and more intimate, though sometimes having the bear look outside of the frame is also very visually pleasing. Here is an example of two similar photos that often have different responses from observers. Which one of these photos grabs your attention more and is more visually appealing? Most people would agree that the top photo is most visually pleasing. Why is that? Some of the reasons might be that: both animals faces can be seen, no object in the foreground such as the sticks are blocking views of the animal, both animals are facing into the frame of the photo, which brings the interest inward, and the upper image is also less cluttered. Though you may not always have a choice about these element when photographing black bears in the wild, remember these as considerations. Trying taking black bear pictures in all sorts of poses, locations and light conditions. It can be great to practice on captive bears at local zoos or wildlife rehabilitation centers. Observing captive animals will help you to familiarize yourself with some of the behaviors, postures and expressions of black bears. This in turn can help you to predict what to anticipate when you are out in the field trying to photograph wild bears. The more familiar you are with black bears, the better your opportunities will be to capture good black bear pictures. Knowing what kinds of tracks and sign black bears leave behind can be very helpful to you in locating them in the wild. Check out this article for more information on Black Bear Tracks and Sign. For more information on wildlife photography, check out the article, Nature Photography for Beginners. For more examples of black bear photography check out National Geographic's black bear page.